The Bureau of Labor Statistics (BLS) released their employment situation report on Friday July 2, 2010. My analysis is meant to expose facts that most casual observers ignore. Instead of the general month-to-month comparison, I am assessing changes in the employment situation over the last twelve months. This expanded view will tell us whether or not the Recovery Act is working. I will begin with my conclusions, followed by excerpts from the BLS report, and end with my analysis. Conclusion: The employment situation is worse than it was a year ago. Although the U-6 unemployment rate stood unchanged at 16.5%, the population increased by 2.0 million, while the labor force fell by 1.0 million, making the employment situation unsustainable. The number of marginally attached and discouraged workers rose to 2.6 million, an increase of 415,000 year-over-year. The number of unemployed persons rose by 317,000. There are 919,000 fewer jobs than there were a year ago. Borrow huge sums of money from taxpayers and foreigners. Raise taxes on the remaining smaller pool of workers who survive Steps 1 and 2, in order to pay for Step 1. Repeat Steps 1 through 3 (if you manage to survive after Step 2). Total nonfarm payroll employment declined by 125,000 in June, and the unemployment rate edged down to 9.5 percent, the U.S. Bureau of Labor Statistics reported today. The decline in payroll employment reflected a decrease (-225,000) in the number of temporary employees working on Census 2010. Private-sector payroll employment edged up by 83,000…. Both the number of unemployed persons, at 14.6 million, and the unemployment rate, at 9.5 percent, edged down in June…. In June, the number of long-term unemployed (those jobless for 27 weeks and over) was unchanged at 6.8 million. These individuals made up 45.5 percent of unemployed persons…. In June, about 2.6 million persons were marginally attached to the labor force, an increase of 415,000 from a year earlier. (The data are not seasonally adjusted.) These individuals were not in the labor force, wanted and were available for work, and had looked for a job sometime in the prior 12 months. They were not counted as unemployed because they had not searched for work in the 4 weeks preceding the survey…. Among the marginally attached, there were 1.2 million discouraged workers in June, up by 414,000 from a year earlier. (The data are not seasonally adjusted.) Discouraged workers are persons not currently looking for work because they believe no jobs are available for them. The remaining 1.4 million persons marginally attached to the labor force had not searched for work in the 4 weeks preceding the survey for reasons such as school attendance or family responsibilities…. The U-6 unemployment rate stood unchanged at 16.5% year-over-year. Civilian Labor Force – According to the BLS, the civilian labor force has declined by a little over 1 million workers, from 154.8 million in June of 2009 to 153.8 million in June of 2010. From table A-16 we learn that out of the 1 million who disappeared, 415,000 are no longer being counted because they are considered to be marginally attached (i.e. persons who want a job, have searched for work during the prior 12 months, and were available to take a job during the reference week, but had not looked for work in the past 4 weeks). Once identified, marginally attached workers are no longer counted as part of the labor force. Out of the 415,000, 414,000 are considered to be newly discouraged workers. The number of persons no longer counted as part of the labor force, because they have stopped looking for work, increased by 415,000 year-over-year. Civilian non-institutional population – The civilian population increased by slightly more than 2 million, from 235.6 million in June of 2009 to 237.7 million in June of 2010. So while the population increased by a little over 2 million, the labor force shrunk by 1 million, which is clearly unsustainable. The employment situation is unsustainable. Persons no longer in the labor force – The number of persons no longer in the labor force increased by 3.0 million, from 80.9 million in June of 2009 to 83.9 million in June of 2010. We learn from Table A-16 (below) that out of this 3.0 million, 415,000 more than a year ago are considered marginally attached (i.e. persons who want a job, have searched for work during the prior 12 months, and were available to take a job during the reference week, but had not looked for work in the past 4 weeks). We also learn from Table A-16 that a total of 6.5 million Americans who want jobs are not counted as part of the labor force, an increase of 7,000 year-over-year. The number of marginally attached and discouraged workers rose to 2.6 million, an increase of 415,000 year-over-year. 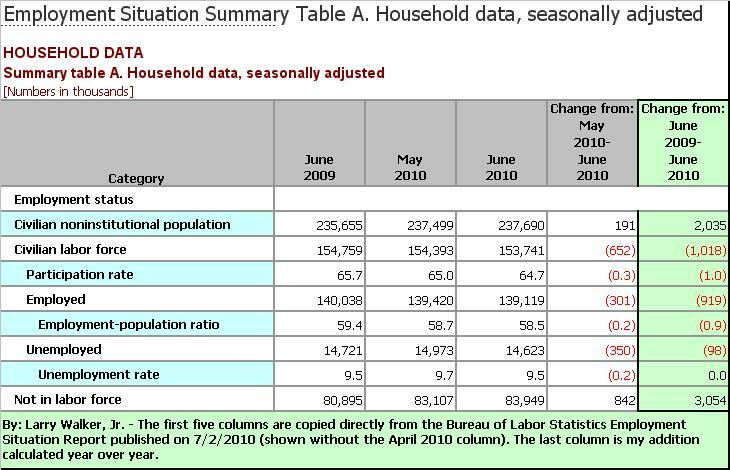 Number of unemployed – According to the BLS, the number of unemployed persons fell by 98,000 from 14.7 million in June of 2009 to 14.6 million in June of 2010. However, this figure ignores the increase in those considered marginally attached, so in reality the number of unemployed persons increased by 317,000 (415,000 more marginally attached minus 98,000 fewer unemployed persons) year-over-year. See Civilian Labor Force (above). The number of unemployed persons rose by 317,000 year-over-year. Number of employed – The number of persons employed fell by 919,000, from 140.0 million in June of 2009 to 139.1 million in June of 2010. In other words, there are 919,000 fewer people working than there were a year ago. 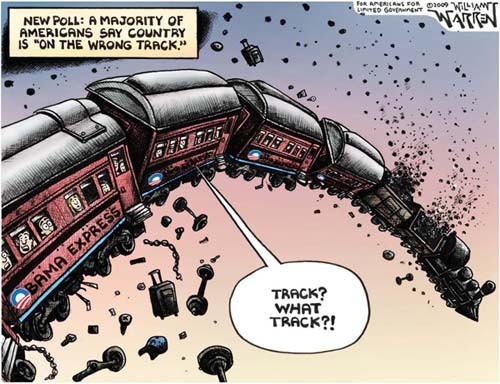 I don’t know why Obama is out boasting about the success of his ‘Recovery Program’ when it is clearly a dud. 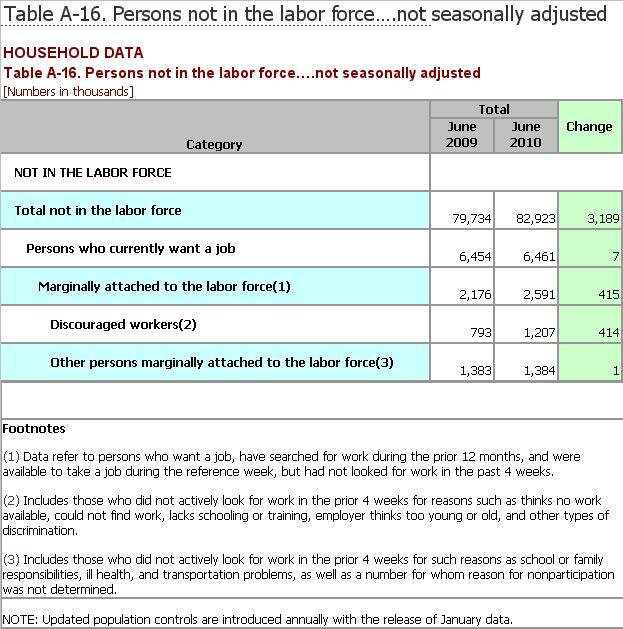 Speaking in plain English, since there are currently 919,000 fewer jobs than there were a year ago, no jobs have been created or saved within the last twelve months (see Table A above). There are 919,000 fewer jobs than there were a year ago.